This is the part 2 of the BLEPP 2015 Baseline data about the occupation or job or respondents, their purpose of taking the licensure exam and future plans (Part 1 here). Majority of the respondents are new graduates so they are not yet employed. Like the data last year majority are employed as human resource officers or specializing in Industrial/Organizational Psychology. A number works as guidance counselor or assistant and others are already practicing psychometricians. For employment/Work/Job: Clinical, HR, Government, Academe/School, Guidance Counselor, Legal, Community (for job application and use in current work). To administer Psychometric Test/purchase of assessment tools. As compliance of DOH requirements on current work. To become a teacher/help younger generations. 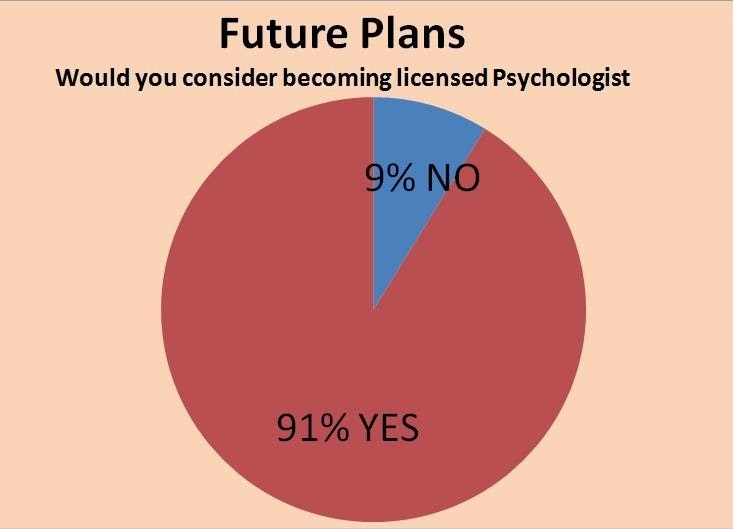 As to their future plans, majority or 91% have the intention to become future psychologists. It also reflect the other data wherein 25 respondents plan to take up graduate studies in Clinical Psychology. Data shows that the majority will take up Clinical Psychology followed by Industrial Psychology. Since most of the respondents are newly graduate so most have not yet thought of what to specialize for graduate school. 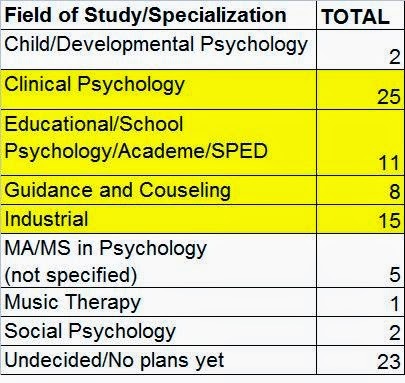 It is also interesting to note that there are other specialization that seems not ventured into by Psychology graduates like music therapy, child/developmental psychology, and social psychology among others. 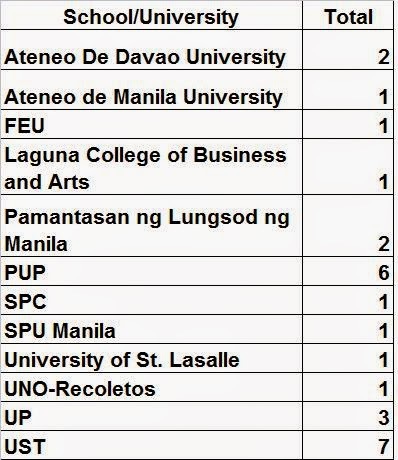 The other table are the most cited schools/universities among survey respondents, top on the list is UST and PUP. However, some respondents did not specify the school/universities they plan to enroll for their graduate school.